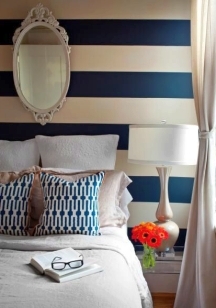 By painting stripes on walls, you can easily change the mood and style of a living space. But did you know that this wall painting technique is also a powerful way to alter the perceived size and shape of any room? 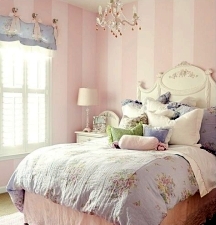 That's why it's important to take your time choosing the paint colors and finishes for the stripes, and deciding on their width and direction - you don't want to inadvertently make a small room look even smaller, or create some other undesired effect. 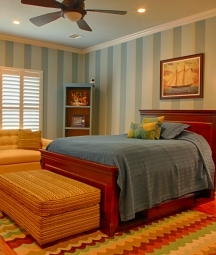 When it comes to painting stripes on walls, color is the most important element to consider. The level of contrast and juxtaposition of colors in the combination will have the biggest impact on the final result - it's the difference between a timeless look and a circus tent. 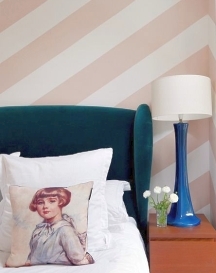 Wall stripes painted in shades of the same color (tone-on-tone) are always a safe choice - you can't go wrong with this classic color combination (just stay in the 1-2 shade range). Light, subtle color combinations are elegant and unobtrusive - they make a room seem more spacious when used in horizontal stripe patterns. Deep, low-contrast color combinations add drama and character to a space, but also make it feel more enclosed, no matter the direction of the pattern. The higher the contrast between the stripe colors (ex. cream and navy blue), the louder the statement and the stronger the room-minimizing effect - but use such bold patterns sparingly (as an accent wall, or just under the chair rail) because they can easily overwhelm a space. Depending on the direction you choose for painting stripes on walls, you can visually manipulate a room's perceived dimensions. Vertical wall stripes look dressy - they can "raise" your ceiling a little (when used in a medium to narrow sized pattern), and add a sense of structure to a boring, boxy space. Horizontal wall stripes create a more casual look - they "push" the walls out and trick the eye by making the room appear larger, and the ceiling lower. Diagonal wall stripes look cool and funky - they are great for creating an illusion of movement in the room, but to avoid a dizzying effect, they are best limited to just 1 or 2 walls. 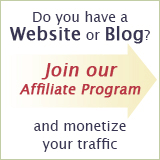 The size of the stripes in the pattern can actually make or break the effect that was created by choosing the right colors and direction, so consider this element carefully as well. The standard (and most optimal) width for vertical stripes is about 6 inches - when in doubt, that's the size to use. Wide, column-like stripes look more casual and may even "squash" the room height-wise, so they work best in rooms with very high ceilings. 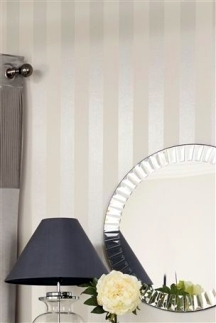 Narrow pinstripes are chic on an accent wall, but start looking too busy when used for painting a room in its entirety (especially when high in contrast). Horizontal stripes should be at least 12 inches wide (unless you are going for a funky look) - in fact, when painting horizontal stripes on walls, the wider is better (e.g. you can have as few as just 3 stripes on the walls and they will still look "enough"). The width of diagonal striping should proportionally increase with the size of the painted surface - for example, you would need a wider size for painting a wall than for striping a table top. Equally-sized stripes are considered classic, but you can always break away from the norm by combining 2, 3 or even more different sizes for an added interest (just remember that the more variety in the pattern, the more contemporary the effect). Most people use the same sheen for painting stripes on walls, so the pattern comes just from the difference in the colors. 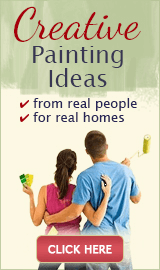 But you can add another dimension to the look of your stripes if you use paint sheens creatively. For example, stripe the walls in exactly the same color, but do it in different paint finishes (for example, flat and satin stripes) - this will produce an understated, classy effect and a subtle play on color where the shinier stripes will appear lighter. Or, if you dare, you can even combine matte stripes with the ones painted in a metallic finish for a bolder but still sophisticated look. Stripe painting is already impressive all by itself, but faux finishing techniques take it one step further - they add depth and texture to the pattern. 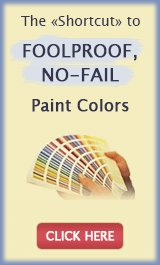 Besides, if you don't like the clean lines of regular stripes, decorative wall painting techniques can produce a more antique or distressed effect, with soft or ragged stripe edges. 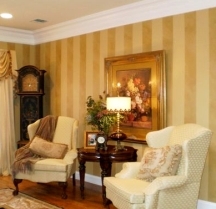 Virtually any faux painting method can be used for striping the walls (sponging, ragging, stencils, etc) but it's best to choose only 1 technique so that there is no competition, and alternate it with normal/solid color stripes - that way the decorative finish will really stand out and be offset by the adjoining, plain stripes.